The El Montiboli Hotel is located a bit south of Villajoyosa, it’s in a unique spot right on the top of a cliff. This means that the views from some of the rooms are amazing. It’s just outside of the fishing village Villajoyosa which is in Alicante. The hotel is quite an impressive building and dominates the skyline. 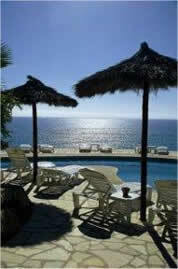 The resort has great views of the rolling hills, beaches and the sea. The rooms also have balconies overlooking the sea, these have areas to dry your clothes. The Montibolil ( you can check pricing and availability here ) is decorated in an elegant yet functional style, there are 50 rooms each of which is very comfortable and has its own unique character. All of the rooms come with air conditioning, heating, satellite TV, piped music, and safe. The bathroom is well equipped and has everything you could wish for, including a hair dryer. It also have suite rooms and bungalows which have a private salon. 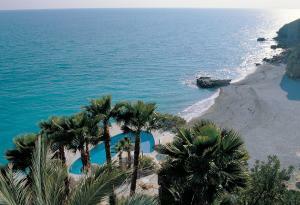 There is plenty to do at this hotel, there are two swimming pools each of which are located on the top of the cliff. One of the pools is a rectangle, and the other one is shaped like a kidney. Around the pool there is a lovely sun terrace. There is also a beach club which has a tennis court, children’s play area, and many other facilities allowing you to do whatever you like. The hotel also has a number of lounges which can be used for banquets and conferences. This is a very safe hotel, as the European regulations are followed strictly. There is also a private parking lot available to guests. The hotel is in an absolutely ideal location which is looking out over the Mediterranean sea, it’s just outside the town so it’s fairly quiet and peaceful. The hotels have wonderful landscaped gardens which will make your stay unforgettable. The restaurants in this hotel serve high quality local and international cuisine with something to suit everyone, no matter how picky they are. The staff are very polite and friendly, nothing is too much for them. It offers several different types of rooms, the romantic room is my personal favorite. This hotel is well suited for anyone looking to get away and have a nice relaxing holiday in the sun. Couples will find the tranquil and beautiful location amazing, but children will also love the area because there is so much for them to do. This hotel really does have it all, it has business facilities, children’s facilities and even things to keep the adults happy. The hotel is also situated within easy reach of all of the popular tourist attractions, even if you don’t have a hire car you should quite easily be able to get around. The hotel is more than happy to assist you with any question you might have. Cribs are available at the hotel, however you must make sure you mention this when you reserve your room, otherwise they may all be used. So there you go, no matter whether you want a comfortable holiday, or a romantic getaway you will find it all at this hotel.